What is the best HDTV Antenna? The answer would seem to be simple… the one that works. But how do you know? There’s a funny thing going on in the world right now. Even though home budgets are strained to the limit, spending on home entertainment hasn’t slowed. Many top economists predicted that spending on home entertainment would slow, especially after the huge surge in HDTV purchases in 2009 but it’s a funny thing… that hasn’t happened. Instead, consumers have focused on making smart decisions and getting more for the money that they have. Many people have made a perfectly sensible choice to “cut the cord…” eliminating a $1200/year expense from a cable or satellite company and combining over-the-air TV watching with an IPTV box like AppleTV or Roku. The cost savings is impressive and when all is said and done, you don’t lose that much. If you’re lucky enough to live in a home built in the mid-20th century you may have an old antenna on the roof, and with a couple of dollars in parts and a willingness to crawl around in the attic, you may have everything you need. Unfortunately, many antennas were taken off roofs in the last 20 years as cable and satellite became the norm. Still more lean excessively, are out of alignment, or have broken or corroded tines. Don’t be discouraged. Buying an antenna is easier than ever and it doesn’t mean a trip to the dusty part of the hardware store. Before you buy, though, make sure you’re getting the right antenna for your needs. There are a lot of variables involved in choosing the best HDTV antenna for your needs. There is also a lot of misinformation. When the HDTV transition started several years ago, the rumor started that all you needed was a cheap UHF antenna. UHF uses higher frequencies than VHF and it’s true, many HDTV channels do use UHF. However, the odds are overwhelming that if you’re in a market with 6 or more channels one of them is VHF. Many stores sell “HDTV Antennas” that are nothing more than UHF antennas. Buy one of these and you’re giving up on channels you should be able to get. The most predictable measure of the antenna you need is your distance from the broadcast tower. Many people who live in major cities can see the broadcast towers sitting on top of one of the tallest buildings in the city. If this is you, you may be able to get away with a very inexpensive antenna. Most of us live in the suburbs of course, and can’t see the skyline from our bedroom windows. For those people, the question is a little more complex. Where are the towers? How far away are you? Are their obstructions like mountains in the way? For this reason some people choose to spend too much money and put a giant antenna on the roof. This is not your only choice. If you are one of those city dwellers you may be just fine with a general purpose antenna like the one pictured here. These antennas are very small and can be used inside or outside. They even have a funky, arty look that might actually pass for decoration in your hipster pad. The majority of people actually live within 40 miles of a television tower. This is no happy accident; it’s the way that the television markets are built. If you’re a happy suburbanite you may be fine with an amplified indoor antenna like the one pictured here. These are relatively small and are designed to give the best result for much of suburbia without requiring you to get up on the roof. They work equally well in apartments. If you live a further away, you’re not out of luck. Unfortunately though, you’re probably going to need a roof-mounted antenna. These are not very hard to install if you’re fairly handy with tools and are comfortable being up on the roof. There are a lot of variables in play though… proper aiming is essential and if you’re trying to get TV from more than one city a rotator may be necessary. The cost of all the parts you need is still probably less than one month’s cable bill. Roof mounted antennas all look a lot like the one pictured at left, but there are subtle differences. The number of tines varies depending on how much signal you need to pull in, and that depends on your distance and the obstructions in your way. The best roof antenna for your needs is going to be the one that catches just enough signal and not too much. If you choose the most massive amplified antenna around, you risk picking up signals that may actually interfere with your viewing. A quick look at the older homes in your area will give you some idea of the antennas that were used in the 1950s and 1960s; this will start you on the right track but it’s not the final answer. Before you set out, it’s a good idea to have some professional help on your side. SolidSignal offers a free service to help you find the right antenna for your needs and there’s still plenty of time to get it done before the big game. We’ve made it easy for you to get the best advice. Our techs are available to answer your questions… just fill out a simple form. 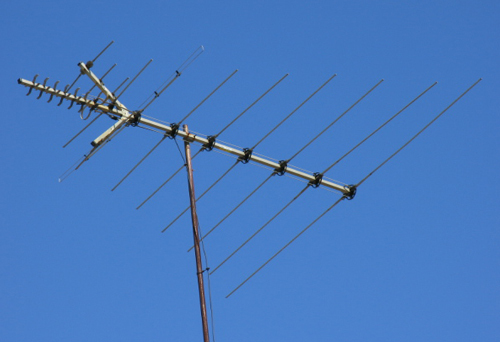 Click the link above to be taken to our TV Antenna help page. Fill out all the important information and we’ll get back to you as soon as possible with a customized solution for you. It’s that easy! The best HDTV antenna is the one that costs you the least but delivers the best performance. Don’t make it a guessing game, though. Take some professional FREE advice and by gametime, you’ll be ready to impress!